Entrepreneurs looking to buy into one of the best commercial cleaning franchises have a solid list from which to choose with these top 15 franchises, of which no fewer than eight have achieved rankings on Entrepreneur magazine’s Franchise 500 list. According to IBIS World, the janitorial and cleaning services industry in the U.S. is now worth $61 billion, up from $56 billion last year, and a third of that is commercial cleaning. Of course, those figures include both franchise and non-franchise businesses. Trends in this industry include “green cleaning” (eco-friendly) and “cleaning for health” (getting rid of germs). Some companies lean more towards one than the other, while others focus on both. Whether or not these stated commitments are serious or meaningful requires closer examination by potential franchisees. JAN-PRO offers customized commercial cleaning plans delivered by janitorial cleaners who are franchise owner-operators, not hourly employees. Among its services is the proprietary EnviroShield commercial disinfectant system, which mimics the same cleaning process used to sanitize hospital operating rooms. The company’s backpack vacuums exceed HEPA filtration standards to deep clean while enhancing indoor air quality, and it also utilizes color-coded microfiber cleaning cloths that eliminate the transfer of germs from one area to another. 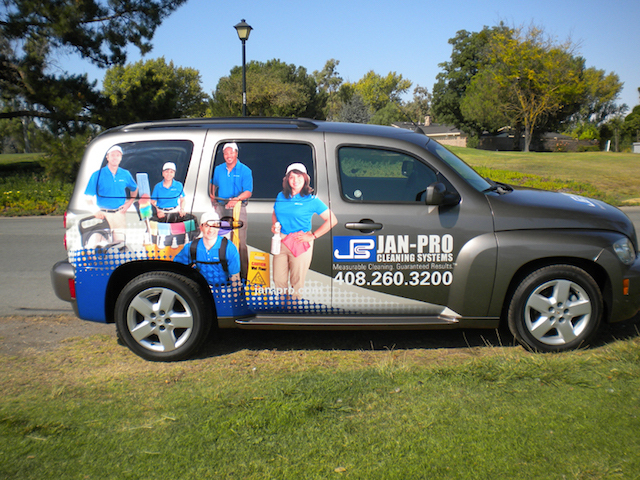 Founded in 1991 and franchising since 1992, JAN-PRO offers both master and single-unit franchises. This company currently ranks #39 on Entrepreneur magazine’s Franchise 500 list. The number of locations has been steadily climbing over the past seven years from 7,084 in 2011 to the current total of 8,790, none of which are company-owned and 1,381 of which are located outside the U.S.
Coverall has been providing commercial and office cleaning services since 1985 to all types of clients from simple offices to a wide range of industries such as healthcare, fitness/spas, retail, education/childcare, and industrial sites. Its Coverall Health-Based Cleaning System “goes deeper” to create cleaner, healthier work environments. While the company talks about achieving its cleaning services in an eco-friendly way, it does not appear to have pursued any specific certifications or seals. Unlike many other commercial cleaning franchises, the company only offers singe-unit franchises, not master franchises. Founded in 1985 and franchising since then, the number of locations has declined over the past nine years from 9,457 in 2009 to the current total of 8,163, none of which are company-owned and 1,203 of which are located outside the U.S.
ServiceMaster Clean started providing commercial cleaning and janitorial services more than 60 years ago for all types of clients. It has developed a healthcare training and certification program for its local owners covering five levels of healthcare cleaning and adheres to standards it has developed based on best practices and procedures for the industry established by OSHA, CDC, AORN, HIPAA, EPA, and other regulatory healthcare organizations. Unlike most companies on this list, it offers in-house financing through its subsidiary, the ServiceMaster Clean Acceptance Company (SMAC). It appears to only sell unit franchises, not master franchises. This company currently ranks #255 on Entrepreneur magazine’s Franchise 500 list. Founded in 1947 and franchising since 1952, the number of locations held fairly steady for several years but dropped from 5,033 last year to the current total of 4,467, 10 of which are company-owned and 1,815 of which are located outside the U.S.
Vanguard Cleaning Systems has been offering a full range of cleaning and janitorial services to a wide range of clients for 35 years through its five service standards: 1) A dedicated account liaison for each customer, 2) Informed and motivated to exceed expectations, 3) Advanced cleaning technologies, 4) Diverse and specialized capabilities, and 5) A disciplined approach. It claims expertise in green cleaning but doesn’t offer up any particular certifications. Vanguard offers both master and unit franchises. This company currently ranks #76 on Entrepreneur magazine’s Franchise 500 list. Founded in 1984 and franchising since then, the number of locations has grown steadily over the last nine years from 1,519 in 2009 to its current 3,327 locations, none of which are company-owned and 330 of which are located outside the U.S.
CleanNet USA has been offering its customized commercial janitorial services solutions to clients of all types for more than 30 years, and can also provide a full range of other interior and exterior building and grounds maintenance services. The company’s Clean Green Program is separate from its conventional commercial cleaning services and is committed to employing a full range of greener cleaning options that can help a building achieve LEED certification, including Green Seal certified cleaning products and greener cleaning methods. Both master and unit franchises are available. Founded in 1988 and franchising since then, the number of locations has fallen in recent years from a high of 5,274 in 2011 to the current total of 2,038, none of which are company-owned and 56 of which are located outside the U.S.
Anago Cleaning Systems serves industries, including healthcare, education, government, hospitality, property management, manufacturing, and everything in between with cleaning and janitorial services. It offers a Total Satisfaction Guarantee and will promptly re-clean anything reported as less than satisfactory. Its Green Cleaning Initiative is constantly looking for new and greener cleaning products along with its HEPA filter vacuums and reusable microfiber cloths. This company currently ranks #52 on Entrepreneur magazine’s Franchise 500 list. Founded in 1989 and franchising since 1991, the company offers both master and single-unit franchises. The number of locations has been steadily climbing over the past nine years from 1,121 to the current total of 1,559, none of which are company-owned and 56 of which are located outside the U.S.
Stratus Building Solutions offers green commercial cleaning and janitorial services to a wide range of clients including schools, medical offices, shopping centers, warehouses, dealerships, religious centers, professional offices, daycares, retail stores, gyms, and more. Its signature offering is Stratus Green Clean, which is an eco-friendly janitorial cleaning service using its own proprietary line of Green Seal Certified (GS-37) Stratus Green Clean chemicals that are biodegradable, non-toxic, and free from VOCs, known carcinogens, and fragrances. It also utilizes low-waste microfiber towels and post-consumer recyclable tools. Founded in 2004 and franchising since 2006, Stratus Building Solutions offers both master and single-unit franchises. This company currently ranks #42 on Entrepreneur magazine’s Franchise 500 list. The number of locations has expanded in the past several years from 1,155 in 2015 to the current total of 1,549, none of which are company-owned and four of which are located outside the U.S.
Buildingstars International offers personalized, comprehensive cleaning services to create cleaner, healthier workplaces across all types of sites and industries. Cleaning services are provided by franchise owner-operators who have a clear path for advancement through the company’s Rising Star Management Program. The company’s eco-friendly initiative is called Buildingstars Green Star program that can include green consulting to help facilities achieve LEED certification, in part through accumulating green cleaning points toward their total. This company currently ranks #199 on Entrepreneur magazine’s Franchise 500 list. Founded in 1994 and franchising since 2000 with both master and unit franchises, the number of locations has grown steadily during the past nine years from 276 in 2009 to the current total of 883, six of which are company-owned and all of which are located in the U.S.
OpenWorks refers to itself as “an integrated facilities management company” because in addition to its core commercial cleaning and janitorial services, it also offers landscaping, pest control, HVAC, electrical/lighting, handyman, plumbing, and supply replenishment services. It claims to be different from other companies because it is committed not just to “maintaining” a facility, but proactively improving it, including aiming for more sustainable (green) systems. Founded in 1983 and franchising since then, the company offers both master and unit franchises, emphasizing to potential unit franchisees that they don’t have to be involved in sales. The number of locations has expanded over the past nine years from 320 in 2009 to the current total of 456. Mint Condition offers the typical full array of commercial cleaning services along with a service guarantee, although nowhere on the website does it explain what the guarantee is. Services are delivered by franchise owner-operators who have received extensive training. It is committed to “cleaning for health” and uses Green Seal Certified cleaning chemicals. Founded in 1996 and franchising since then, the company offers both unit and master franchises. The number of locations has grown steadily over the past nine years from 134 in 2009 to the current total of 344, none of which are company-owned and all of which are located in the U.S.
Jantize America has been offering a full range of commercial and janitorial cleaning services to facilities and industries of all types for nearly 30 years. The company website says Jantize is a “Certified Green Cleaner,” but there’s no explanation or documentation of what that means or who has provided the certification. Founded in 1988 and franchising since then, the company offers both unit franchises and area developer/master franchises per city. Jantize hasn’t reported current number of locations, and the website doesn’t have that information either, but the last known total was 157 locations in 2017, which was a drop from its most recent high of 247 back in 2012. Office Pride Commercial Cleaning Services provides full-service janitorial and floor care services. Its green cleaning commitment includes Green Seal Certified cleaning products, microfiber mops and cloths, and high-filtration vacuums. The company does clearly describe itself as a faith-based franchise system that has incorporated honoring and glorifying God as central to its mission and values. There is no mention of master franchises, so this is a unit franchise opportunity. This company currently ranks #365 on Entrepreneur magazine’s Franchise 500 list. Founded in 1992 and franchising since 1996, the number of locations has climbed over the past nine years from 110 in 2009 to the current total of 134, none of which are company-owned and all of which are located in the U.S. Image One Facility Solutions offers a range of commercial cleaning services to clients of all types. It claims a commitment to green cleaning, but it’s not backed up by much information, detail, or documentation. The company guarantee is backed up with a commitment to correct the situation at hand. Failing that, the customer can terminate the agreement and receive a refund of up to a month’s worth of charges. The chain sells unit franchises of different types depending on how much business the franchisee wants to handle. Founded in 2010 and franchising since 2011, the number of locations has nearly doubled in the last several years from 56 in 2014 to the current total of 107, none of which are company-owned and all of which are located in the U.S. Founded in 2005 and franchising since 2008 with both master and unit franchises (and in-house financing for the latter), the chain has expanded over the past nine years from only 13 locations in 2009 to the current total of 76, all of which are franchised in the U.S. and none of which are company-owned. City Wide Maintenance has been providing clients with comprehensive cleaning and janitorial services for 58 years that can include floor care and windows, along with a full range of interior facility maintenance and handyman services, as well as exterior maintenance services such as grounds-keeping, landscaping, snow removal, painting, and more. The company website does not mention master franchises, so the opportunity is for unit franchises. This company currently ranks #175 on Entrepreneur magazine’s Franchise 500 list. Founded in 1961 and franchising since 2001, the number of locations has grown slowly but steadily over the past nine years from 23 in 2009 to the current total of 55, one of which is the company-owned flagship location in Kansas City that also serves as the franchisee training site. All are located in the U.S.